If it is true that location is everything, then the Y Service Station and Café along old Route 66 in Clinton had it all. 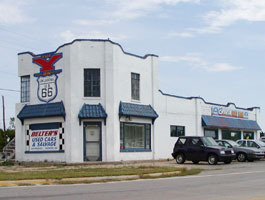 Constructed in 1937, this roadside business was strategically located on a triangular lot that formed the fork in a Y shaped intersection on the southern outskirts of Clinton. Tenth Street, which doubled as Route 66, splits at this point, with Route 66 continuing off to the west and U.S. Route 183 heading south. Situated in the middle of this fork with gas pump islands flanking both highways, the Y Service Station and Café prospered. Typical of its era, this full service roadside facility offered not only food, fuel, and auto repair, but lodging as well. About 100 feet to the south of the station and café on the same lot were the Y Modern Cabins, which are no longer standing. Aside from its golden location, this business indirectly received an added boost from the New Deal. Starting in 1936, the City of Clinton directed part of its Federal Works Projects Administration funding toward developing this southern suburb. WPA projects extended city water lines into the area and constructed Neptune Park. Soon the “Y” found itself in the middle of a busy commercial district. Designed in the Southwestern Mission Revival style, the building housing the service station and café has stucco finishing, curvilinear parapets, and simulated red roof tiles. In its original form, the pronounced height of the building’s northwest corner parapet (now reduced in height) seemed to mimic a classic mission bell tower. Yet the building also contains a strong hint of a streamlined Moderne styling, which was also in vogue at that time. The flat roof with coping around its perimeter and a corner, metal window in the northeast second floor are typical of this look. This eclectic approach to style and design illustrates a simple but central point about business ownership and roadside architecture in the age before corporate standardization. Owners were free to build and design as they pleased. Travelers along historic Route 66 are still enjoying the results. Traffic and profits continued until the mid-1950s, but at that time, the Y Station learned a very hard lesson about doing business along the Mother Road. In the words of historian Michael Cassity, “what Route 66 had brought, it could also take away.” By 1956, traffic on 10th Street was so dense that the highway was realigned. The new alignment bypassed the Y Service Station and Café. Like many roadside businesses bypassed by Route 66, the Y Service Station did not die, but instead evolved. Today, the gas pump islands are gone, the brick trim is painted blue, and blue metal awnings dominate. The building is currently host to an automobile dealership. Still, a large sign on its second floor reminds visitors that the Y and Route 66 once were closely, and profitably, connected. The station was listed in the National Register of Historic Places in 2004. The former Y Service Station and Café is located at 1733 Neptune Dr. in Clinton, OK and is an automobile dealership accessible to the public.